The Rezidor Hotel Group opened the Radisson Blu Resort, Gran Canaria. The 189-key property is Rezidor’s first hotel on the Spanish island of Gran Canaria and joins Radisson Blu Madrid-Prado as the company’s second hotel in Spain. Each of the 189 rooms offers a private balcony with views of the Atlantic Ocean. Interiors include marble flooring and stylish furniture, all conceived and developed by Norwegian design studio Sias Contract. The hotel offers signature Radisson Blu amenities such as complimentary high-speed Internet, three-hour express laundry and late check-out. Radisson Blu Resort, Gran Canaria serves an array of local and international cuisine at La Canaria restaurant. In addition, the Beach Bar at the resort’s outdoor pool serves light snacks, and the top-floor terrace lounge offers a menu of island cocktails. The outdoor leisure area at Radisson Blu, Gran Canaria features a garden, salt and freshwater swimming pools, a gift shop, a boutique, a supermarket, and a kids club. The resort also has a spa featuring treatments from Paris’ Institute Guinot, a well-equipped fitness center, and a range of indoor and outdoor sports facilities, including tennis courts, a paddleball court and a beach tennis/volleyball court. The Gran Canaria property marks the latest in Rezidor’s demonstrated resort development pipeline and growing Radisson Blu resort portfolio. 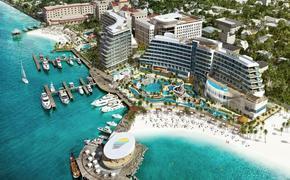 The hotel joins new Radisson Blu resorts in Split and Dubrovnik, Croatia; Cesme, Turkey; and Calzignano Terme, Italy. An upcoming resort development is slated for Porticcio, Corsica.